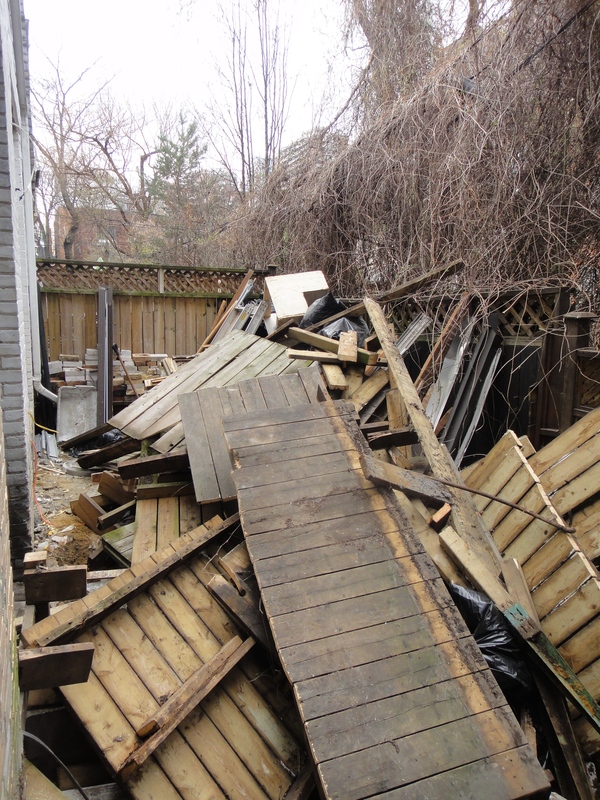 Last summer I knew it was time to replace the old deck hanging off the back of my historical townhouse. I estimate the last one was built 50 years prior- the decking boards were green with mold (the townhouse shades the narrown deck for most of the day) and the flooring was soft and worn. I got my attached neighbor to agree to re-do his too; this way we could save on demolistion cost, deliveries, installation, etc. 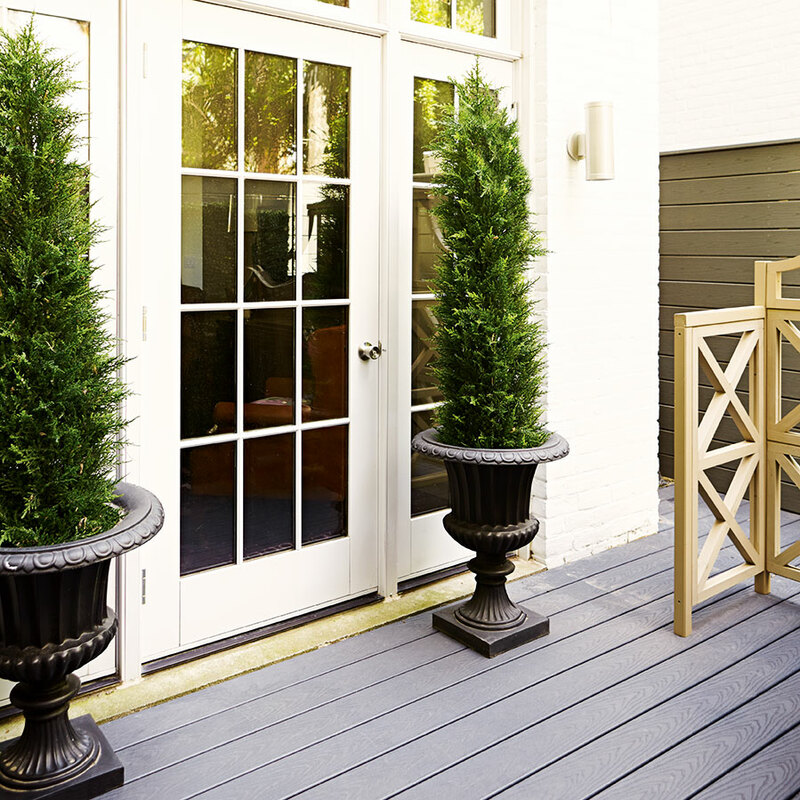 I worked with the Home Depot to design the deck and to help choose colours & materials. I am very happy with the results and feel like I have extended my living space during the warm weather months. BEFORE: During demolition. Each deck is 12′ deep and 14′ long. 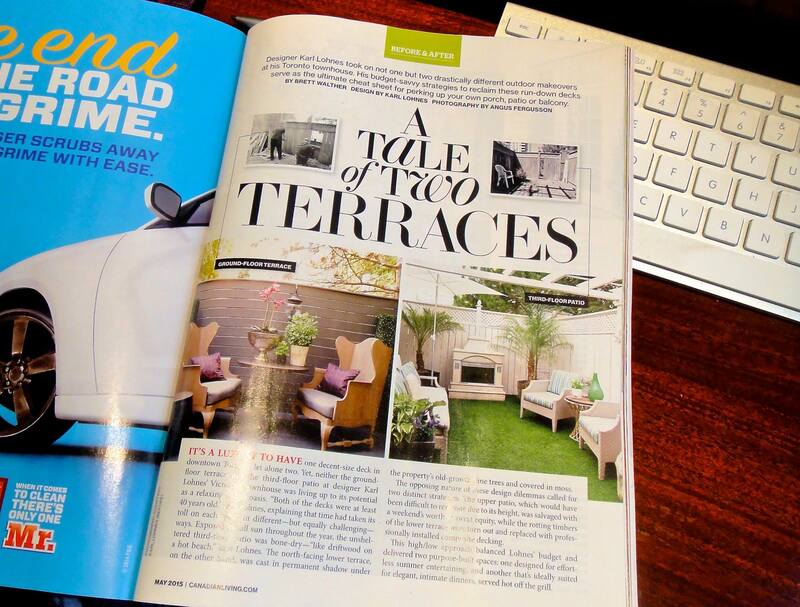 AFTER: The results were so dramatic that Canadian Living magazine featured in their May 2015 spring issue. You can read the article online HERE. I wanted the main part of the deck to feel like an extention of my townhouse sitting room. Although the deck is quite modern, traditionally-styled furniture and lighting create a focal point that reflects the style of my inside space. 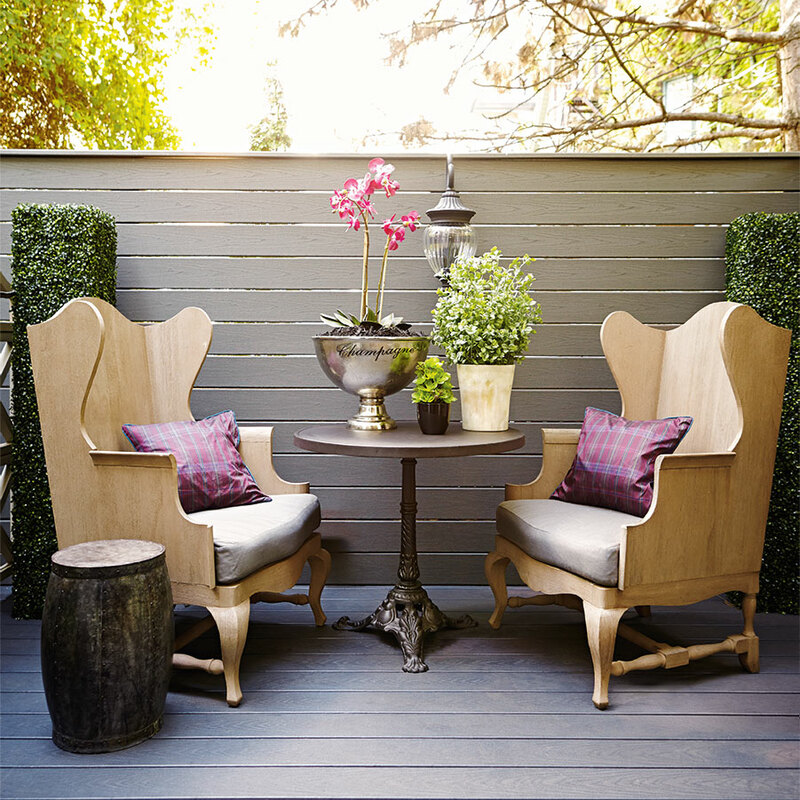 The solid teak wing-back chairs were purchased at an end-of-summer sale from Restoration Hardware. When I am tired of using them outside, I will paint them a glossy white and re-purpose them indoors with new cushions. All the greenery is faux… I am a horrible gardener and wanted an easy-care deck so ‘everlasting’ plants were the way to go for me. PS: even the orchid is faux… planted in an aluminnum champagne bowl to add some sparkle to the deck! I painted the old brickwork on the back of the house fresh white; this really helps to reflect light and brighten up the shaded space. The everlasting cedars stay in the urns year-round and look fantastic with white mini lights during the winter. 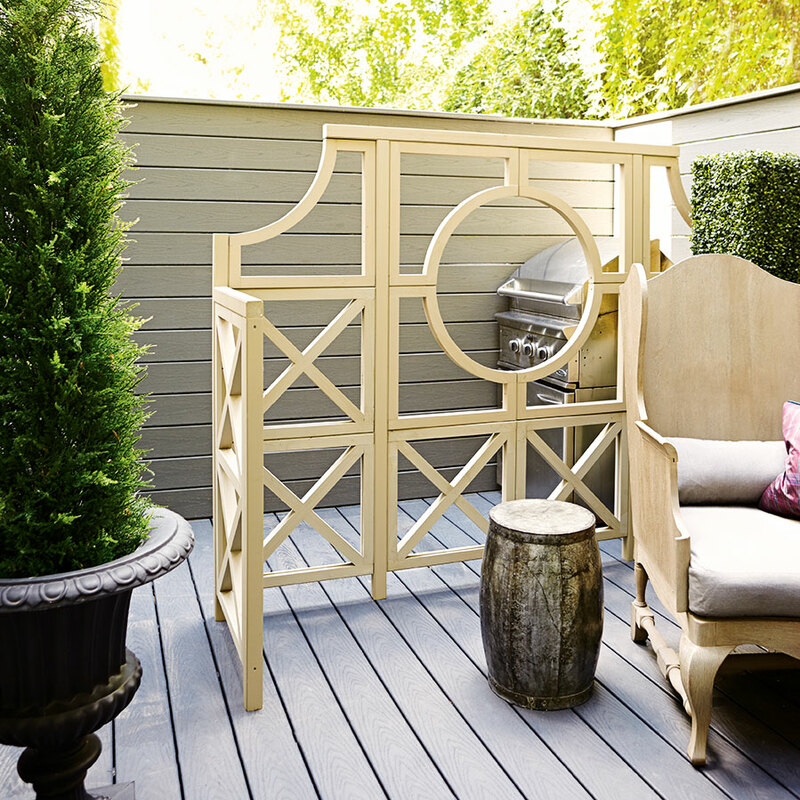 A backyard screen helps to visually divide off a grilling area and create a room-like feeling on the deck. Notice I used two different colours for the decking material; Trex Enhanced Clam (walls) and Winchester Grey (floors). This helps to take away the boxiness that all one colour would have created (this was a great tip offered by the deck designers/installers at M.E. Contracting. The decking material looks like wood but is an engineered decking material that will not fade or wear like real wood- I just love how easy it is to keep clean and care for. Like the new deck? Please click the LIKE buttom below. Not following me? Click the FOLLOW button below. I look forward to sending you more inspiration style ideas each week. Cheers! Home Accessories Your Guests (and you) Will Love.